TechScan is a technical analysis tool. It is seamlessly integrated in the NanoTrader and analyses more than 10 stock markets, 130 forex pairs and 15 market indices every day. These markets and instruments are analysed using over 100 technical analysis indicators, statistical data and trading strategies. Beautiful and extensive charts and graphics. Covers the full technical analysis domain by using technical indicators, statistics and strategies. The number of instruments analysed is vast. Includes tools for pairs trading and market outperformance. TechScan scans more than 10 stock markets (Germany, France, US, Belgium, Netherlands ...), more than 130 forex pairs (EUR/USD, EUR/GBP, ...) and more than 15 market indices (DAX, CAC, Dow ...). Each new signal is illustrated with a beautiful chart showing the signal. All buy and short sell signals are saved for each financial instrument so you can see if there is an increase in signals. In addition to forex pairs and market indices, TechScan currently analyses stocks from these markets: U.S., Germany, France, Belgium, Netherlands, Switzerland, Poland, U.K., Spain and Italy. The results of TechScan’s overnight analysis are displayed in the quick overview table which you can see above. For each stock, forex pair and market index TechScan provides a detailed analysis including a history of previous buy and sell signals. This example shows the stock Amgen which is part of the S&P 500 index. 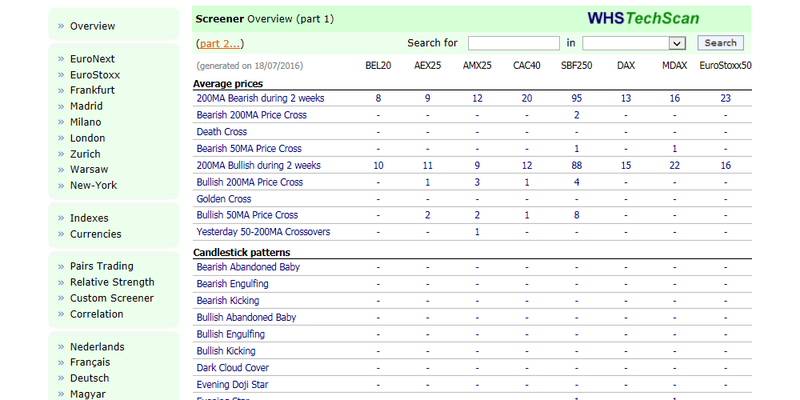 By clicking on the small icons the trader can get an even more detailed analysis. Traders are always interested in stocks which outperform or underperform their index. TechScan provides this information. Traders can set their own horizons. This example shows the three stocks which outperformed the S&P 500 index the most over the last year. TechScan indicates the correlation percentage between one stock and another or between a stock and an index. The tool will indicate which stocks are closely correlated or traders can select their own pairs. This example shows the relative strength of the stocks Adidas and Puma over the last 10 years. TechScan is an amazing free tool which identifies on a daily basis swing and day trading opportunities for traders and active investors.